But I’ve learned that you shouldn’t feel limited by one industry, or one, particular skill. There’s no need to. One year, for example, I was an on-call funeral singer for my former church choir director. It wasn’t the most uplifting of gigs, but it was the highest hourly rate I had ever earned. And I loved having the chance to sing on a regular basis. It often gets lost in the word nerd shuffle, but my singing is important to me. Then there’s my most recent endeavor. 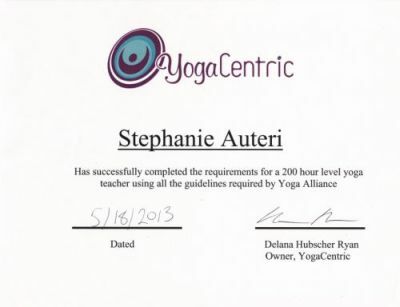 Just this past weekend, I graduated from my 200-hour yoga teacher certification program. There are no words for how excited I am. Last night, I tossed and turned, brainstorming the things I would do next: Get on sub lists at a variety of studios. Earn my CPR certification so I could apply for gym opportunities. Seek out corporate gigs so I could teach professionals about work/life balance and stress reduction techniques. Plan a yoga and writing workshop with my best OMie. Pitch myself to yoga and wellness companies for some of the same work I now do for sexual health professionals. It feels so good to add this to the mix. To have something I love SO MUCH as just one more tool in my freelance toolbox. If you’re interested in learning more about generating multiple streams of income, you might be interested in this panel I’m speaking on later this week. What non-word nerd skills might you be neglecting in the pursuit of creating diverse income streams? It’s interesting to see how seemingly unrelated certificates and interests can open up possibility for new opportunities. I don’t freelance full time but do some web design on the side when I’m not doing it at work. I’ll have to think of some other ways to put those skills to use. It’s interesting how these non-word skills actually come into play when we’re writing as well. I am a wedding celebrant as well as a writer (and I also run an e-commerce store, because who needs to sleep, right?) and I’m finding more and more that my expertise in this area is leading to wedding-related writing gigs. So that’s doubly good! Steff, I had no idea you were such a crooner! And I’m jealous of your yoga certification. I’m still a rube at yoga, though I’ve been at it for years.